At Geneva airport, in the duty free. 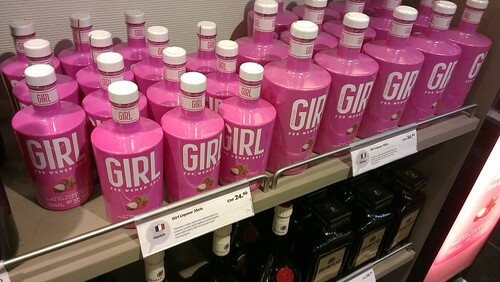 It is LYCHEE AND RASPBERRY flavour vodka.The small print reads "For Women Only". I had a look around to see if there was a male equivalent that tasted of cigars, gunpowder and saddle leather, but there was nothing of that ilk. I can only assume this is aimed at the sort of delicate flowers that can't handle neat whiskey ... I don't like neat whiskey but I wouldn't drink this on principle. Am I getting grouchier as I age? I find myself more appalled by things like this (which I think would be described on Twitter as #everydaysexism) than I ever used to be. I found this letter from Lady Curd today that I quite liked, for example. I do wonder what has happened to make me feel more strongly about topics like this over the years, but I can't pinpoint it. Incidentally, and while on the topic of that blog, I also LOL'd a lot at the reader letter featured in this particular post. I have not read Lady Curd's reply because, tbh, it's late and I think I can probably guess what it's going to say. The letter is gold, though.